The Cape and Islands offer a special destination in the springtime, too! Beginning with the crocuses, spring flowering bulbs poke their colorful heads up out of the ground during late March. By early April there will be a riotous explosion of color with the daffodil front and center. Two major celebrations of the daffodil are held in May in Brewster on the Cape and in April on Nantucket Island. Brewster in Bloom weekend this year will be May 3 - May 5, 2019. This annual event kicks off with the Brewster Band in concert at the Brewster Baptist Church. Throughout the weekend you can enjoy an arts fair, chowder festival, road race, dinner dance, antiques and collectibles fair, and tours of Brewster’s historic homes. Don’t miss Sunday’s grand parade at 1:00 down Brewster's Main Street. For more information, visit the Brewster in Bloom website. Find a nearby beautiful Cape Cod rental in Brewster and the surrounding areas on WeNeedaVacation.com for the weekend. In early May, over three million daffodils of every color, shape and size will bloom on Nantucket Island. 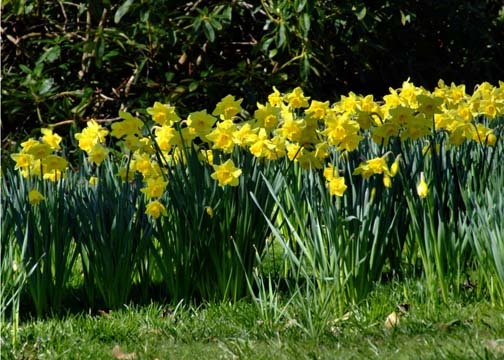 This blossoming, as well as the advent of spring itself, is the focal point of the Nantucket Island Chamber of Commerce’s Annual Daffodil Festival being celebrated the weekend of April 27 - April 29, 2019. Need a place to stay for the weekend? Many of our Nantucket homes offer weekend rates in the spring. Originated by the late Jean MacAusland, a summer resident of Nantucket and former publisher of Gourmet magazine, the weekend has grown into a full-scale celebration of winter’s thaw, joyous for both Islanders and visitors alike. Daffodils adorn the Island’s roadsides, gardens and shop windows with blossoms of yellow, orange, white and even pale pink. The Daffodil Festival’s grand event held on Saturday is the Annual Antique Car Parade, featuring over 100 daffodil-bedecked antique cars. After winding through town and across the Island to the charming village of Siasconset, participants join residents and visitors for the Annual Daffodil Tailgate Picnic. Held on the lush lawns leading into the village, the picnic boasts fare ranging from elaborate gourmet cuisine served on fine china to box lunches and burgers. Other highlights include the Nantucket Garden Club’s Annual Daffodil Show, Children’s Daffodil Parade, and The Daffy Hat Pageant. For more information, visit the Nantucket Daffodil Festival Weekend website.